How to stop Rust on your Car? New Information in April 2019! Rust, it’s a ferric thing. Actually, rust is iron oxide, and that is represented by the letters Fe on the periodic table, and that is short for Ferric. When someone says Ferrous Oxide they mean rust, and this will hit any iron alloy that does not include special elements that prevent rust, such as stainless steels. Since stainless steel is expensive, car makers use the cheapest iron alloys (steel) to produce many motor parts. These parts come with initial factory surface treatment that prevents the accumulation of rust. However, over time and with use, rust will appear where the iron has been exposed to the elements. Air contains oxygen, and that is all that iron, and its alloys need to oxidize. You don’t need to live by the sea, you can have a car in the middle of the desert, with no visible signs of water anywhere, the oxygen in the air will work the same, and you will have rust. So, what to do? Well, that answer is easier than you think, its called preventative maintenance. However, preventative maintenance will only work when there is no rust; once there is rust you will need to perform certain rust cleaning procedures and then prepare the surface for rust prevention. This is a circular process, for once you reach stage three, you go back to stage one and start all over again. Now let’s look at rust and understand its nature and how it appears, the signs and symptoms that lead to the ruddy-colored scourge of car owners. Rust is Fe2O3, which is iron oxide. Iron and most iron alloys will completely rust, that is reduced to a pile of red dust over time. Unlike aluminum that oxidizes on its surface, where the oxide protects the rest of the material from disintegrating. Iron oxide, rust, continues to eat into the metal until the entire body of iron (alloy) is oxidized. 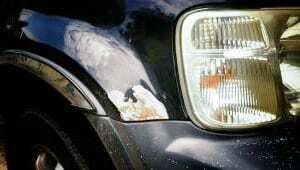 The first symptom/sign of rust is a bubble in the paint or a red colored scratch on the surface. These are easy to solve as well as great reminders to prep your car for preventative treatment. Surface rust is apparent on all iron alloys, and even pure iron (which is not used in its pure form) has surface rust, but this rust usually doesn’t penetrate the iron as fast as its alloys. The steel alloys that are predominant in cars include carbon, and this is the cause of excessive rusting. 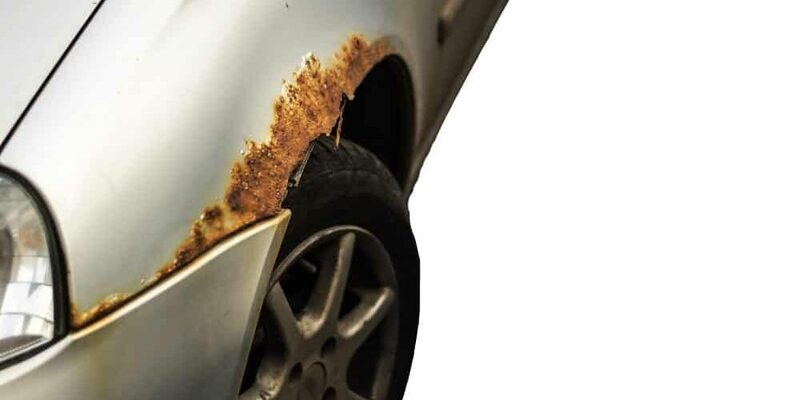 Surface rust is the first indicator of rusting and can be dealt with immediately and effectively. It can appear everywhere: on your tube headers, your Wrangler’s or Grand Cherokee shock absorbers, or even your favorite Silverado exhaust system. This is the second level of rust when the surface rust has been left to continue its feast and starts to eat through the body of the metal. Different alloys scale differently, and this is based on metal composition and form. Forming is both the way the metal is produced and treated after machining. All iron compounds will rust eventually, and then a spot of salty water touches the surface of steel, it acts as an electrolyte, making the process even faster. For instance, winter salt used to clear roads and driveways is the worst possible surface to drive on by any vehicle. You will find that winter vehicles tend to rot much faster than the dryer state vehicles, and this is more to do with the salt used to clean surfaces rather than the wet atmosphere, which also acts as a catalyst. The surface rust becomes thicker rust, and you can see layers and scale in the metal where the rust has penetrated the part. RAMs have some problems with such kind of rust, especially on the flares, so consider to buy fender flares for Dodge RAM 1500. This is the third and final stage and is when the rust has gone from one side of the body part to the other, essentially creating holes in the surface of the metal. All car makers provide comprehensive rust prevention solutions, but the end results are always going to be in favor of mother nature and the environment. Iron alloys are the least expensive and provide the best performance for most parts that can be made of different materials. While there are many other materials to consider, the price will always be the most popular reason for using iron alloys. No matter how many surface treatments and covers the parts have received, the moment a microdot appears on the surface, from even the impression left by a grain of sand, rust will penetrate. This rust spot, when left untreated will turn into a crater of rust and eventually lead the total disintegration of the component. If the component is attached to another iron alloy part, that too will be affected. Preventative maintenance is the buzzword in all sectors today, and there is a reason for this. When you maintain perfect conditions for a part, you maintain the life of the part in most environments. Preventative maintenance will include washing the car regularly, which removes salt water, salts and other corrosive elements that cling to the car. Make sure that all the nooks and crannies of the frame of your car are checked and cleaned regularly too. 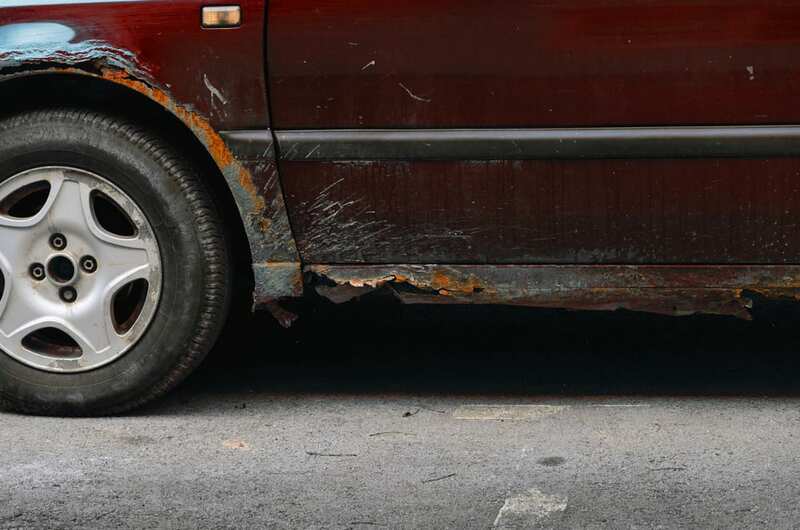 The best way to remove any surface rust that appears, and it will appear either as a slight ripple/bubble or as red dust over an exposed surface. You must remove all the rust from that surface by using abrasive applications that will scour the surface and its vicinity. Once the rust is completely removed, you will get a shiny metal finish. Apply primer to this area immediately. The next step is to either paint that area yourself by adding paint and a clear coat of varnish or take it into the shop for a proper paint job. When you find a patch of scale rust, the situation is more critical. You will see this as a proper bubble, usually with cracks in the surface and rust seeping out. Or you will see raised surfaces of rust over the iron surface. The rust has started to flake away, and it is destroying the integrity of your part. To clean scale, you will need a metal wire brush in addition to the scouring materials and will need to clean in depth, like a dentist, clear away the rot from inside until you have a completely clean surface. You can also use a grinding wheel if required; this will create an even surface that is easier to treat after the cleaning is completed. This rust is split between two categories; critical parts and non-critical parts. Critical parts require full replacement. The rust has damaged the integrity of the design, and these parts are no longer safe for use. Non-critical parts can be cleaned, filled with cement style fillers and painted over, like body covers. Personally, I suggest replacing all parts that are infused with penetrated rust holes. Start off by hosing down your car completely, including the underside. It might be prudent to use a power washer for getting into the wheels, bumpers and underside parts. Make sure there is no mud, grunge or any other kind of dirt attached to any surface of your vehicle. Check for rust over the entire surface of your vehicle, be extremely conscious at joins and parts that connect. These parts tend to abrade and are usually the first to show signs of rust. The other surface is the general surface of the vehicle, such as the body, the framework, the doors, bonnet and trunk, the wheelbases, the exhaust system, and the engine block. Check for bubbling on painted surfaces, and for rust dust around abraded surfaces. Never let water accumulate in any area, if you see water accumulation, drain it immediately and find a way to prevent this from happening in the future. The trunk is especially susceptible to this and is usually the cause of many a rotten Also, check around the bumpers and wheelbases. If you live in a winter land environment where there is a lot of snow, then you are also facing a lot of salt for dealing with the accumulation of snow and ice on the roads. The best way to clean your undercarriage is to use baking soda when washing your vehicle. Baking soda neutralizes the salt. Gasoline and sand are also corrosive to paintwork, so if you see any gasoline spots, or sand accumulating on your body surface, clean it up immediately. Be careful with sand, use water to wash it off, if you wipe it, the sand can cause scratches in the paint which will lead to surface exposure to the elements, and that means rust. After applying soap, rinse it off completely, soap is alkaline and can eat through surfaces over time. Waxing your vehicle is a must, at least twice a year. This not only protects your paint, but it also gives your car that brand-new look. Use rust arrestor after cleaning the rusty surfaces, apply this and let it dry, and then apply the primer coating of paint. If the part you are treating is unpainted, then only use rust arrestor to treat the surface. Don’t use standard paints, purchase car paint from a distribute or car center. You can even match the color by checking your cars VIN and finding out the exact name and OEM number of the paint used.